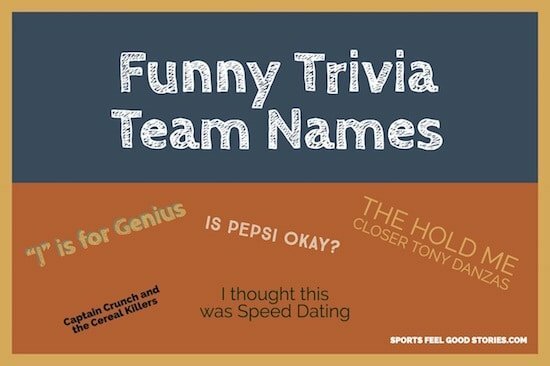 Funny Trivia Team Names – You’re on page 2 of 2 Trivia Team Names. Coming up with naming options for your squad can be a lot of fun. 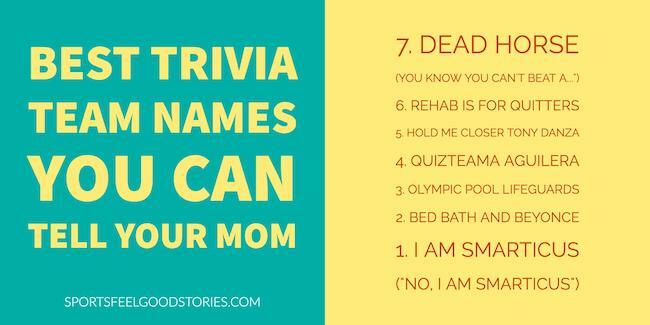 Trivia refers to bits of information, frequently of little importance. Currently, the largest trivia contest is held in Stevens Point, Wisconsin by a local radio station as a fundraiser. For many, a big part of Trivia Night or any contest is just coming up with a great moniker for your squad. That’s where our collection can help. Have some fun with these lists. Only Here to Establish an Alibi. Our answers aren’t wrong they’re “alternative facts”. What Concert Costs 45 Cents? 50 Cent and Nickleback. What, are we living in Yahtzee Germany? I had a dream I was a muffler, I woke up exhausted. Trumpty Dumpty sat on a wall…that Mexico is going to pay for. I’ll take beer for 100 Alex. We’ve never been there, and we’re not going back. I’m Not Sure How to Pronounce This. Our Drinking Team Has a Trivia Problem. Hello, Quiz It Me You’re Looking For? I thought this was Speed Dating. If we could use Google, we’d win all the time. Smarter than a 5th grader. It was the Busta Rhymes, It was the Worsta Rhymes. We came, we answered, we failed miserably. The first rule of trivia is don’t talk about trivia. I’m ashamed to read this. Plan B is our Plan A. Funny Like I’m a Clown? The Doctor is his Mom. The Hold Me Closer Tony Danzas. Captain Crunch and the Cereal Killers. Russia already told me the answers. I love bad chickens, that’s my plucking problem. Gaston: Winner of the No Belle Prize. You looked good from Jafar. What is a Cow’s Favorite Movie? MOOOOOOO-lan. The Lady and The Champ. You might be in the market for some funny wifi names. Click on graphic above to take you to that page. Shark Side of the Moon. Tiki Torches are for Porches. The trivial pursuit of happiness. The Doctor is His Mom! Nice Pants (Scream “Thanks” every time your name is called). Antarctica vs. Democracy: Which will last longer? A Gringo Ate My Baby.